“At rare moments in scientific history, a new window on the universe opens up that changes everything. Today was quite possibly such a day. 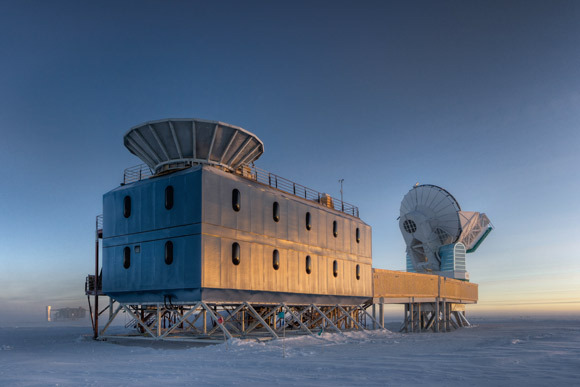 At a press conference on Monday morning at the Harvard-Smithsonian Center for Astrophysics, a team of scientists operating a sensitive microwave telescope at the South Pole announced the discovery of polarization distortions in the Cosmic Microwave Background Radiation, which is the observable afterglow of the Big Bang. The distortions appear to be due to the presence of gravitational waves, which would date back to almost the beginning of time. This observation takes us to 10-35 seconds after the Big Bang, as gravitational waves from that time can travel unimpeded through the universe. By comparison, the Cosmic Microwave Background—which, until today, was the earliest direct signal we had of the Big Bang—was created when the universe was already three hundred thousand years old. Even as someone who has been thinking about these possibilities for the past thirty-five years, the truth can sometimes seem stranger than fiction. In 1979, a young particle physicist named Alan Guth proposed what seemed then like an outrageous possibility, which he called Inflation: that new physics, involving a large extrapolation from what could then be observed, might imply that the universe expanded in size by over thirty orders of magnitude in a microscopically small fraction of a second after the Big Bang, increasing in size by a greater amount in that instance than it has in the fourteen billion years since. Guth’s work was designed to address what were then seemingly irreconcilable problems with the standard Big Bang model, which did not offer explanations for why the observable universe is so incredibly uniform on large scales, and how it has continued to expand for so long without collapsing once again. Inflation, crudely put, explains how the universe is likely to have grown shortly after the Big Bang, to bridge the gap between our hypothesis about the origins of the universe and the universe we observe today. But the hallmark of great theory is its ability to predict future discoveries, not merely explain previous ones. Within a few years, Guth and a host of others demonstrated that quantum mechanical effects during this very early period immediately after the Big Bang could have generated primordial variations in matter and radiation that resulted, owing to gravity, in the formation of all observed cosmic structures, including our earth, our galaxy, and all observable galaxies. Moreover, the special characteristics of these “primordial lumps”—produced when the size of the universe was smaller than a single atom—might be tested if we were able to probe out to the farthest reaches of the known universe. Remarkably, one such prediction arose. If gravity is also subject to quantum mechanics, then it was shown that, during inflation, quantum fluctuations in gravity would be produced, and would appear today as gravitational waves—ripples in the fabric of space and time. Gravitational waves are incredibly difficult to detect directly: we have built huge detectors here on Earth, which are so sensitive that they can detect a force that changes the length of a two-mile-long detector by an amount smaller than a single proton. So far, however, no signal has been observed. This turned out not to be the case. But on Monday, nature may have revealed a more exciting possibility. A more sensitive probe of the microwave background—one that measures how the light generated at the time the C.M.B. was created might be “polarized” as space is alternatively compressed and stretched by gravitational waves—apparently sees precisely the signal expected from Inflation. Moreover, the amplitude of the effect is indeed more or less expected if the scale of Inflation is the scale expected for Grand Unification. Besides the other remarkable implications for physics of such a discovery, if it turns out to be confirmed by other experiments, think about what this implies for our ability to explore the universe: when we use light to look out at the distant universe we can only see back as far as three hundred thousand years after the Big Bang, when the universe cooled sufficiently to become transparent to light. But gravitational waves interact so weakly that even waves produced less than 10-35 seconds after the Big Bang can move through space unimpeded to give us a window on the universe at essentially the beginning of time.